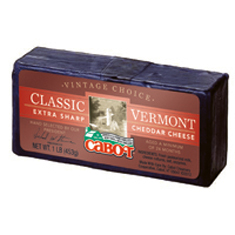 Even among the extraordinary cheeses of our Founders’ Collection, Adirondack is quite unique. 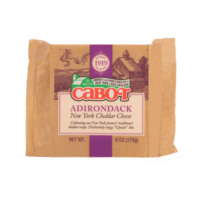 Crafted with care from the original recipe created by Cabot’s New York founding farmers in 1919, this cheddar packs that distinctively tangy “Upstate” bite that sets it apart from other New England cheddars. Aged a minimum of 12 months, Adirondack carries hints of grapefruit and bergamot within a crumbly texture that still feels creamy and smooth. The creaminess of this cheese gets even more pronounced as it warms to tasting temperature, making it an ideal selection for a cheese board or fruit tray. To bring out its spicy back-notes, savor it with a steaming cup of Early Grey or enjoy alongside a candied citrus peel. Has won awards around the world for its gutsy, robust flavor. 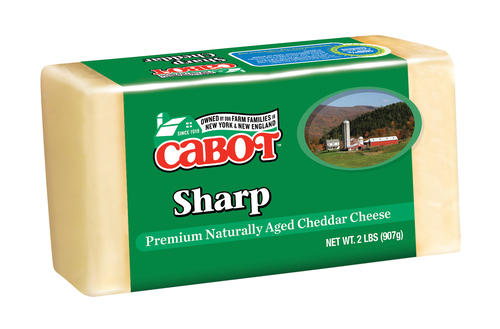 The distinct sharpness that Cabot fans and connoisseurs worldwide have come to love is the result of five to eight months of careful aging. Specially chosen for its complex taste and texture, our Vintage Choice cheddar is aged for up to two full years before receiving its purple wax jacket. Rich, heavy-bodied and boldly flavorful. 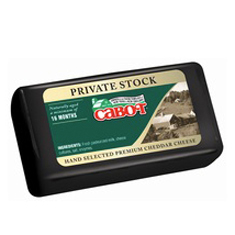 It’s hard to tell which makes our farmers more proud: how smooth our Private Stock is, or how sharp our Private Stock is. 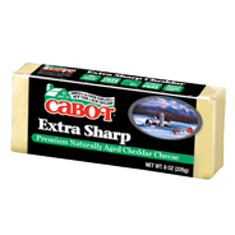 This favorite is aged for up to 18 months to develop its sensational flavor. Aged gently for nine to fourteen months, Extra Sharp boasts a richness and dense texture that make it an essential ingredient for fondues and party platters. 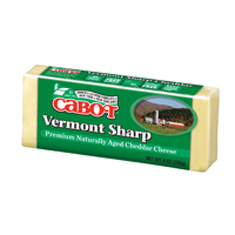 Its full-bodied flavor pairs perfectly with a hearty ale or sturdy wine. 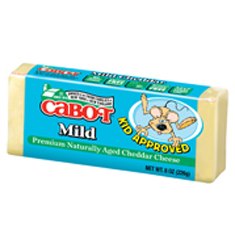 Aged for two to three months, is a creamy cheese young, fresh, smooth. 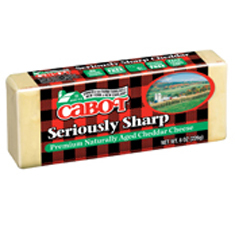 This versatile cheddar is great for slicing, grilling, or for making a knock-out pizza or an amazing Mac ‘n’ Cheese. Its kid-friendly flavor is not too sharp, and always perfectly tasty.